ZJTEX solar power air conditioner use solar collectors to gather the sun power and put the heat as part of heat that compressor needed, save the part of electricity of compressors need. It is named solar-assistant air conditioners, its compressor and refrigerant same as normal ones just save cost for electricity. It could save 60% cost in the day with sunshine and 30% in the night. * ZJTEX solar power air conditioner quite fit the seasonal demand, which means, the COP is increased as the solar energy is most plentiful in the summer. * Freon, widely used by conventional air-conditioners, is damaging our atmosphere. Our ZJTEX solar power air conditioner works with our special medium and newest refrigerant which is completely environment friendly. * Vacuum tube solar collectors were invented in the USA and China decades ago, mature technology and high quality will guarantee the performance of our solar power air conditioner. 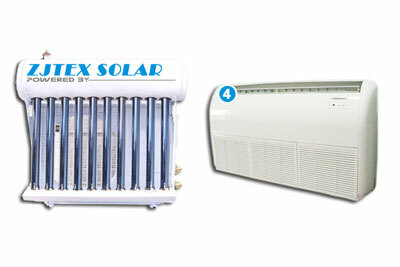 * ZJTEX solar power air conditioner are cost-effective. Our solar power air conditioner system is produced in the USA and China, due to the low cost of the labor, land and R&D. The price of our solar power air conditioner system is very competitive and affordable for our clients worldwide. * ZJTEX solar power air conditioner can combine air-conditioning and solar hot water systems together, therefore enhance market attractiveness. * Our products solar power air conditioner have all the functions as conventional Air-Conditioners do. Such as dehumidification and bacteria free ventilation to help refresh the air inside your home or business. Install solar water heaters, the property right to interfere in it? At present, a lot of plot there is the dispute by the owners to install solar water heaters, the reasons are the property company for the aesthetic considerations of the district as a whole, as well as solar water heaters installed to increase the weight, there are security risks, and prohibit owners install. The property owners have the right to interfere in the installation of solar water heaters, became the focus of attention. The two manuscripts compiled and distributed here has some typical, it gives people inspiration, owners the ability to install solar water heaters, its decision is not in the owners 'committee to develop property company owners' convention. Residents in the district to install solar water heaters, consultation and property, because solar water heaters to be installed on the roof, maybe there will be leakage phenomenon, affect other tenants living. Accordance with the relevant provisions of the implementation from September 1, 2003 "Property Management Regulations", the housing ownership artificial owners, the roof is a public site, in theory, each of the owners have the right to use, including the top floor, including each floors owners to install solar water heaters, you have to go through all floors of the owner's consent and signature. Property company as a service company, the equipment housing and ancillary facilities and related venues maintenance, conservation, management and maintenance of the functions of the relevant regional environmental health order, but shall not be entitled in the case without all of the owners authorized agree or prevent the owners to install solar water heaters. In this dispute, the property company should actively help all of the owners as soon as possible to set up the owners' committee and the owners' committee to discuss and decide whether or not on the roof to install solar water heaters included in the owners' convention, because the provisions of Article 17 of the Property Management Regulations " Landlord Convention is binding on all owners.